The following are highlights and some photos from a busy 2005 (before we had a blog). 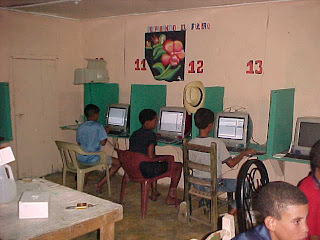 Batey Libertad computer lab finished and up and running! Thanks to Paul and UVM’s geology department, Suzanne, Gary and Lou for the iMacs, and to Jonathan for setting them up with Spanish operating systems and software. Nanota’s “Bed Project” finished! University of Vermont students raised funds for beds for some of the elder batey residents who were sleeping on floors … in time for Christmas! Thanks to UVM’s Center for Health and Wellbeing for helping to fundraise. Dec. 1 – World AIDS Day class presentation of Nov. trip and projects, Batey Libertad fundraiser, and screening of A Closer Walk at the University of Vermont. Thanks to our co-sponsors: University of Vermont’s Dept. of Animal Science, Community Development and Applied Economics Dept., Environmental Studies Program, and Center for Health and Wellbeing. 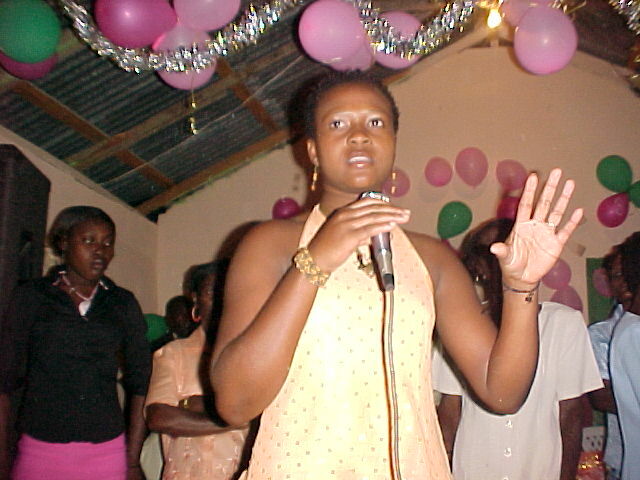 Nov. 27 – Second Anniversary Celebration of Batey Libertad Women’s Group. Thanks Laurie for fundraising! Nov. 16-25 – University of Vermont class to Batey Libertad. Numerous projects by date below, plus the class helped with the new school construction, set up computers for the new lab, and got together with their pen-pals. 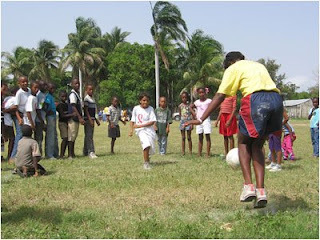 Nov. 23 – Grassroot Soccer demonstration and soccer match at Batey Caraballo. Thanks to our hosts Sara and Caitlin at the DREAM Project. Nov. 21 – Batey Libertad to the beach! 2 gua guas and 2 mini-vans stuffed full with smiling faces. 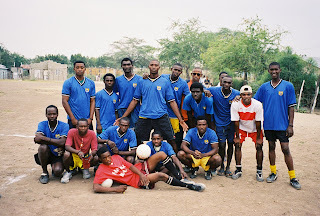 Nov. 20 – Soccer Tournament at Batey Libertad. Batey Libertad Men’s team win amongst 8 teams! Nov. 19-20 – Two-day youth soccer tournament in Esperanza. Batey Libertad Boy’s team win! Thanks to Essex United Soccer Club for all the donated jersys and soccer balls. Nov. 20 – New York Times story published on labor abuses in bateyes entitled “Immigrant Laborers from Haiti are Paid with Abuse in the Dominican Republic“. Carlito from Batey Libertad quoted. Nov. 18-19 – Batey Libertad Community Health Clinic. Thanks to MAP International and Champlain Valley Urgent Care for medical supplies. Nov. 17 – Grassroot Soccer training and demonstration at Pontificia Universidad Católica Madre y Maestra in Santiago. Thanks to the Dean of Students for hosting us! Nov. 16 – Batey Libertad fundraiser and seminar by Paola Peacock Villada, GRS/BL summer teaching fellow, at Harvard School of Public Health, Cambridge, MA. Nov. 12 – UVM Rubenstein School of Environment and Natural Resources graduate student fundraiser for Batey Libertad. Thanks Brendan, Leah, and Val for an awesome event. Nov. 7 – Dinner Out! Batey Libertad Fundraiser at the Tantra Restaurant and Lounge, Burlington, VT. Thanks to July for making this happen! Oct. 8 – Batey Libertad Raffle at UVM Parent’s Weekend Annual A Cappella Concert. Thanks to Nikki for making this happen, and to the Top Cats and Cats Meow for helping us fundraise! Thanks also to the many downtown Burlington businesses that donated items for the raffle, including: Apple Mountain, Ben &amp; Jerry’s, Borders Books, Bruegger’s Bagels, Lindt &amp; Sprungli Chocolates, Olympia Sports, Peace &amp; Justice Store, and Uncommon Grounds. Oct. 7 – Jon and Pat Erickson present “Sustainable Development and the HIV/AIDS Pandemic” at Annual Conference of the Caribbean Institute, Burlington, VT. Throughout the month – Juggle-a-Thon Batey Libertad fundraiser with boys and girls soccer teams of Montpelier, VT public schools. Thanks Nooch and all the athletes for making this happen! UVM fundraiser supports trip of Batey Libertad community to 2-day medical specialist clinic in Santiago. Thanks for the ride Ramon! 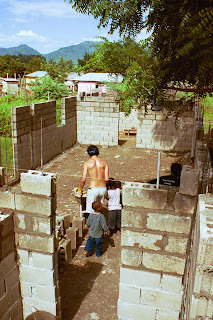 Ben Bellizzi, University of Vermont alumni, begins 8 week trip to Batey Libertad to continue Grassroot Soccer teacher training and youth instruction, teach English language classes, and coordinate plans for computer lab and new school building. T-shirt fundraisers at Vermont soccer camps. Thanks Nooch and Ben! July 22 – Jon Erickson presents “Grassroot Soccer: Using Sport for Health Education and Social Change” at the Third Biennial Meeting of the U.S. Society for Ecological Economics, Tacoma, Washington. Demonstration of Grassroot Soccer curriculum at Batey 6 near Santo Domingo with Vision Mundial project. Yanlico, Milanda, and Wilson from Batey Libertad run the activities with Paola and Kirk Friedrich (Managing Director for GRS) on hand. Covered by National Public Radio (see Nov. 05). Jul. 1-3 – Batey Libertad Community Health Clinic. Thanks to MAP International and Champlain Valley Urgent Care for medical supplies. Jun. 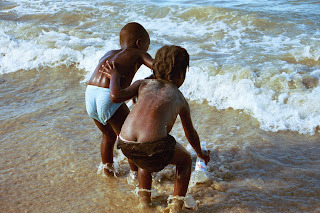 28 – Batey Libertad to the beach! Thanks for the ride Ramon! Paola Peacock, Grassroot Soccer/Batey Libertad summer teaching fellow begins 3 month trip to Batey Libertad to train Libertad soccer players to facilitate HIV/AIDS prevention education curriculum and coordinate projects. Jun. 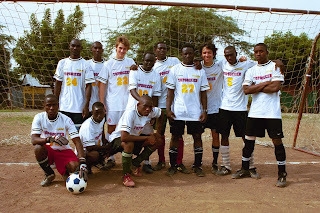 5 – Grassroot Soccer training of BLC volunteers and Africa Teaching Fellows with Kirk Friedrich, managing director of GRS. May 13 – Military raid of Batey Libertad (see article on illegal deportations in El Caribe). University of Vermont group commenced an emergency fundraiser to provide immediate support for all the effected families. Thanks to Mary Fobare for the timely donation! 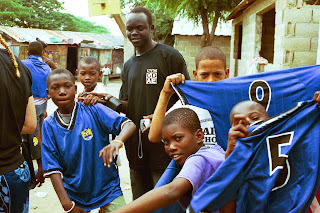 Throughout the month – Grassroot Soccer t-shirt fundraiser. Thanks to UVM graduate student intramural teams for outfitting their teams with GRS t’s. Apr. 30 – Jon and Pat Erickson present “Grassroot Soccer: Sports in HIV/AIDS Education and Social Change,” at the Batey Relief Alliance’s 3rd International Conference – HIV/AIDS in the Dominican Republic and Haiti – a Bilateral Challenge, Columbia University, New York, NY. Apr. 27 – Grassroot Soccer workshop with students from New York City’s High School for Environmental Studies. Mar. 18-20 – Batey Libertad Community Health Clinic. Thanks to MAP International and Champlain Valley Urgent Care for medical supplies. Mar. 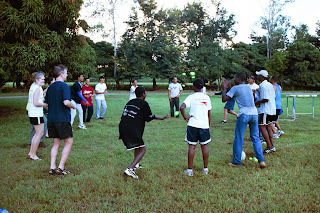 20 – Soccer tournament at Batey Libertad. Men’s team wins. Mar. 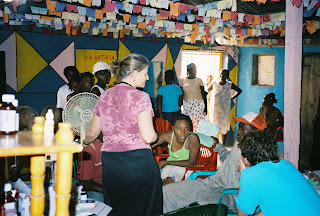 19 – Host BRA Dominicana for a site visit at Batey Libertad Community Health Clinic. Haitian art auction held at the University of Vermont to raise money to build school and health clinic at Batey Libertad. Thanks to all the UVM students for purchasing and lugging the art back from Santo Domingo. 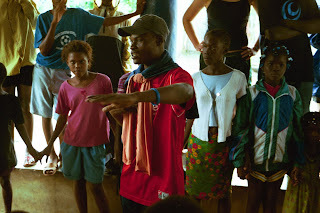 Jan. 3-16 – First University of Vermont service-learning class to Batey Libertad. 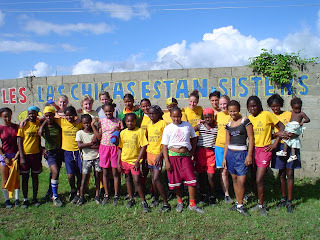 Trip milestones included: initiated pilot Grassroot Soccer HIV/AIDS prevention education program; presented results of pilot to Batey Relief Alliance in Santo Domingo; initiated community health clinic program.